Two Italian managers come head to head as Manchester City welcome Chelsea to the Etihad Stadium. Manchester City lost their last match, away at Swansea, and this was Manchester City’s second loss in six games and whilst they stay firmly in the title race, the game against Chelsea is going to be a significant test to Mancini’s team. A resurgent Chelsea stand in their way and the pressure is firmly on Manchester City after watching Manchester United destroy Wolves at Molineux on Sunday. Chelsea themselves are picking up form although their League form tells us it’s only two wins out of six for them (W2 D2 L2). However under Di Matteo’s stewardship they have won four on the bounce with two wins in the FA Cup, one in the Champions League and their last Premier League game Vs Stoke at Stamford Bridge. 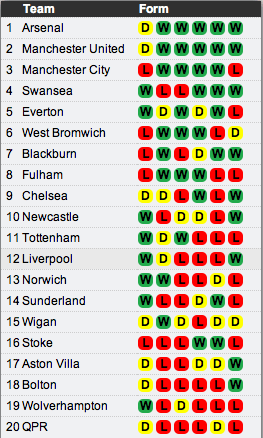 An impressive achievement after the inconsistent form experienced whilst Villas Boas was in charge. On the road Chelsea have lost their last two games at Everton and West Bromwich Albion. They have not lost three games away from home in a row since Dec 2002-January 2003. Meanwhile Manchester City are looking to set a Premier League record of 20 consecutive wins at Home. Will something give? Someone will set a record of sorts or will records be lost? Carlos Tevez has scored in each of his last five appearances Vs Chelsea (6 goals in total) so he may be a key player if he can get a start today. Manchester City have also scored in their last 26 home games after a goalless draw in November 2010 Vs Birmingham City. A key battle will be how well compatriots David Silva and Juan Mata can control the game for their teams. If either of these players can show their influence it could tip the game in their teams favour. The stats below show that both of them are having fantastic seasons and although David Silva may have more assists than Mata, it is Juan Mata that has created more chances for his team and at a better rate than his rival. They’ve both scored five goals and their Chance Conversion is the same too. 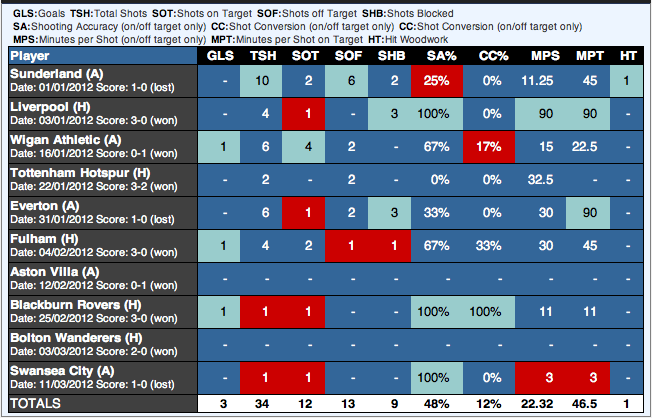 They differ on shooting accuracy where David has the edge. 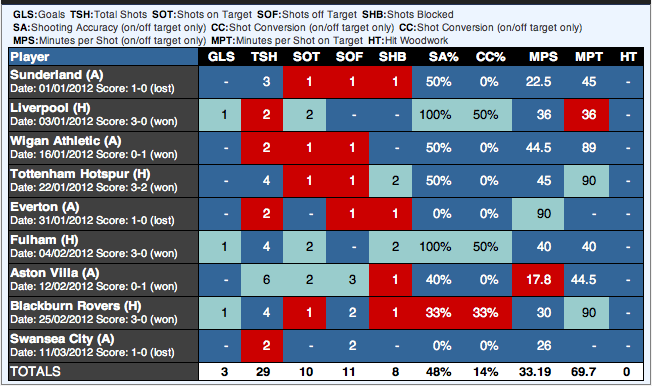 It’s worth noting they they’ve attempted 46 and 44 shots at goal this season so they’re pretty close in each and every aspect of the game. Apart from Daniel Sturridge Chelsea’s strikers haven’t really produced this season and their main threat has been from Lampard who is the top scorer for them in the Premier League with ten goals. 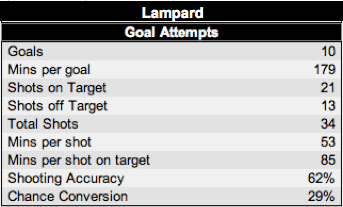 Lampard’s form has been impressive this season scoring a goal every two games and managing 62% of them on target. His chance conversion of 29% is higher than all three Manchester City strikers highlighted in this article (Aguero 22%, Balotelli 23%, Dzeko 22%). Meanwhile Manchester City can call upon Sergio Aguero, Mario Balotelli and Edin Dzeko. However how have these three performed in 2012? The stats show that all three players have only scored three league goals each in 2012. As a combined force that is great however they were lighting up the league in the first half of the season and the stats below show their performances / finishing haven’t been as crisp as the first half of the season. Is it burn out or pressure? Or a combination of both? We’d recommend starting with Dzeko and Aguero in this game. In an astonishing statistic when either Dzeko or Aguero have scored for Manchester City this season they have won every single game in the Premier League. Therefore they are yet to drop any points when Aguero or Dzeko have scored. Records are there to be broken but if either of these two end up on the scoresheet against Chelsea I’d wager that Manchester City will run out winners of the contest. For Chelsea it’s going to be all about keeping Manchester City quiet at the Etihad, if that’s possible. Chelsea have already beaten City this season and are looking for their ninth double over them as well as winning three consecutive games against them as the last two have been at Stamford Bridge. As we’ve concentrated on the strikers it’s probably going to end up a low scoring affair however we hope the trend of high scoring games between the top clubs this season continues and that the Premier League is treated to a classic. All of the stats from this article have been taken from the Opta Stats Centre at EPLIndex.com – Subscribe Now (Includes author privileges!) See Demo’s and videos about the Stats Centre & read about new additions to the stats centre. Thanks to footbo.com for the featured image. Categories: Chelsea (NN), EPL Index Featured Article, EPL Index Match Previews, EPL Index Statistical Comparisons, and Manchester City (NN).' 'Tags: Aguero, Balotelli, CFC, Chelsea Stats, David Silva, Dzeko, EPL, epl opta stats, Juan Mata, Lampard, Man City Stats, MCFC, and Opta Stats.